The store is tiny and I didn't have a chance to actually test the skates, but during the few minutes I had them on they felt great. Now I got home and put the skates on while chilling at home and after a few minutes I'm feeling agonizing pain in both feet probably because the skates are at least half a size too small. My toes barely just touch the edge of the boot but they certainly do touch the top of the boot, where the laces begin. They are basically crushed and I lose all feeling in my toes after 20-30 minutes. As you understand, I bought them in Canada and now I'm back home in Israel with a skate I'll never be able to wear. They are still brand new, I haven't taken them out to the street. Am I stuck with a $700 paper weight? skate them and they should break in, in time. You would have noticed they were too small during the initial fit, what you are experiencing is very common, so don't panic. The solution can be as simple as bandaids, thin socks and sweat! Place a durable bandaid on the portion of your foot that is rubbing on the boot, thin socks will allow the boot to mold around your feet, but you may get more rubbing and cause more blistering in new areas. Once you've applied more bandaids to the new spots, just wear them as often as you can... the sooner you start sweating in them the sooner they are going to mold around your feet. Break in can be a painful process with some boots, the trick is to take steps to prevent permanent injury or scarring ASAP. If you don't have some relief after about 40 or so hours of break in, then you may have a legitimate fit issue. I contacted Seba, Seba's Israeli official distributor and the Shop Task store in Toronto, trying to figure if I could just replace the boot. Anyhow, I'll wait for replies from the stores/distributors before I do anything crazy. Relace the skate skipping the area where it hurts. I don't know if heat molding will work. Heating up the boot softens the epoxy used to stiffen the carbon fiber and allows you to reform it before it cools and resets. I've tried to look up your boot online. Some sites say it is carbon fiber, but others say fiberglass. It may have to do with the model year. Either way, that material is only for the stiff bottom of the boot. It looks like your problem is with the top fabric part (leather?). This will stretch in time, and does not require heat molding. Heat may help break down the material and make it softer sooner, but nothing is going to replace the time it will take to break in the skate. I would recommend simply tightening the boot as much as you can without cutting off circulation and sitting in it for 10 minutes at a time while watching TV. Use your fingers the work the problem area back and forth. Consider a leather conditioner if it is leather. Don't use alcohol - that will break down the material and get you to the desired point faster, but it will shorten the boot's lifespan. You can skip an eyelet or two when lacing, then relace with those eyelets in a month or two as the boot breaks in. If you can find a cobbler they have special stretching tools that might help. It's leather-looking but I don't think it's leather. Anyway, I paid the $175 and got a bigger size. Now here's to hoping it won't stretch and become too big in a month. Did you try taking the laces off and relacing the boot with your foot in? When I tried out a boot at the rink, my foot was in pain, so I brushed it off as being too small. I then went to a pro shop, and the pros there told me that I needed to relace them, and it fit perfectly afterwards. If the pain is across the top of your foot, it means the laces are too tight across that area of the foot. I always loosen up the laces all the way down the boot when I first try on a new pair of skates. Then putting the skate on and then do the laces up, somewhat, but not super tight. 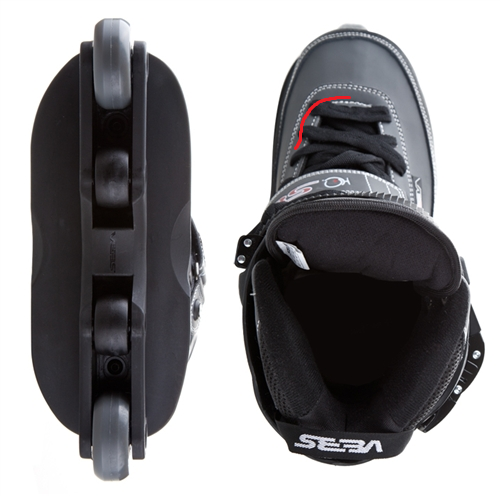 The liner will also shape around your foot to a certain degree when you are using the skate regularly. If you get pain at your toes and sides of your feet, the skates are the wrong width or size for your feet. New skates and shoes often have paper pushed down into the toe (for some reason), but I guess everyone knows to remove that. If you get sore ankles or heels - it's because the skates are too big and your feet are moving around inside the skate. You can counter this with a different pair of skates or a different size liner. Try adding a shock absorber heel pad and/or an innersole if your feet are only moving around slightly. Muscle pains in your feet and ankles are because you are not used to skating or your new skates feel somewhat different and your feet need time to get used to them. Short amounts of regular skating will help here. I've had this same issue with a couple of Riedell boots, 1150 and 195, where the eyelets land right on my toe knuckles. With the 1150 it eventually stopped after the leather stretched, from just skating, putting the eyelet in a different area, not over the knuckle. I am currently going through that process with the 195. As for now I just skipped that first set of lace holes until the boot stretches some more.